A second batch of images from the Oliver Nestus Freeman Round House Museum of Wilson, NC, has been added to DigitalNC. Many of the images document civic clubs and sororities in Wilson. Included is an image of Booker T. Washington with the Wilson Men’s Club. We’re also pleased to present four very fragile scrapbooks from the Museum. The first three are full of portraits and family scenes. Although the photos are labeled with a good number of first names or familial titles, we have very little definitive information about the people inside. (If you know more, contact us.) The fourth scrapbook has a collection of pressed leaves. 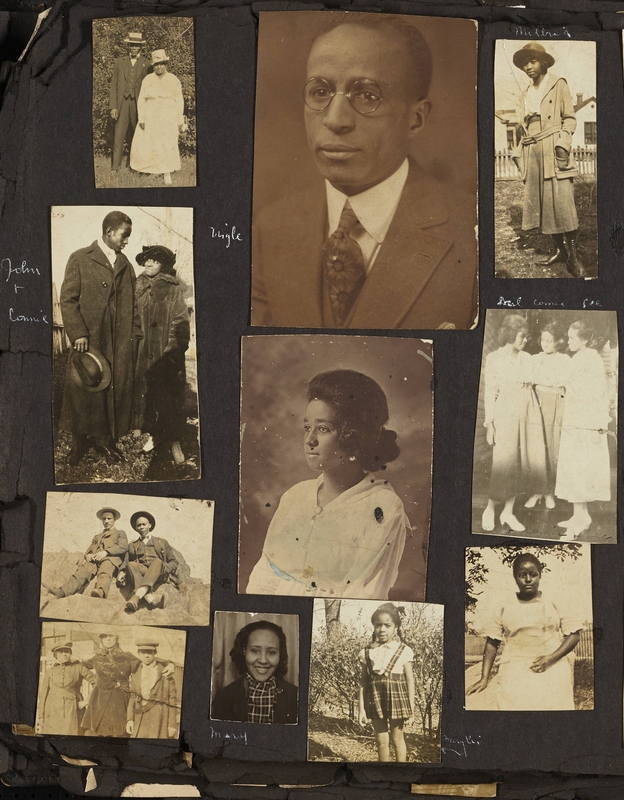 Forty-five photographs from the museum are now available online, in addition to a number of other documents and items related to Freeman and others in Wilson. You can view all of the items here. 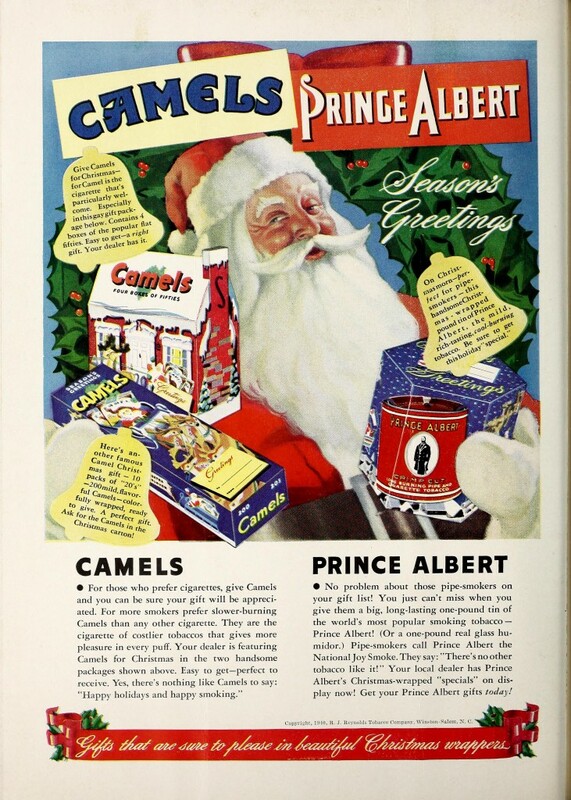 The R.J. Reynolds Tobacco Company ran full-page, full-color ads from 1935-1942, all featuring a Santa who stresses that tobacco is above all such an acceptable gift, though he is never pictured smoking himself. R.J. Reynolds, located in Winston-Salem, N.C., ran these advertisements in the University of North Carolina at Chapel Hill’s Carolina Magazine, a long-running campus publication that served as a literary supplement to the Daily Tar Heel, the campus newspaper. 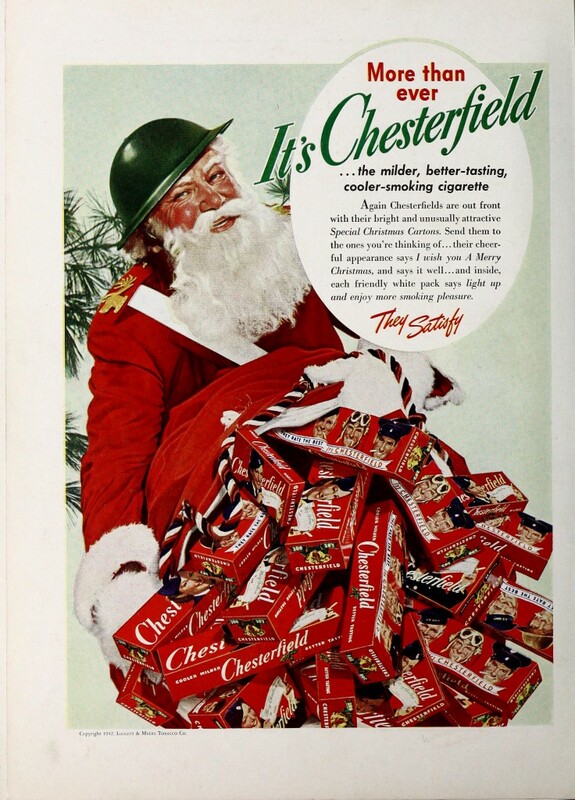 In 1942, another tobacco comopany, the Virginia-based Liggett & Myers, switched their Chesterfield advertising tack focus from glamorous winter women to Santa, perhaps following RJ Reynolds’ success with their campaign. 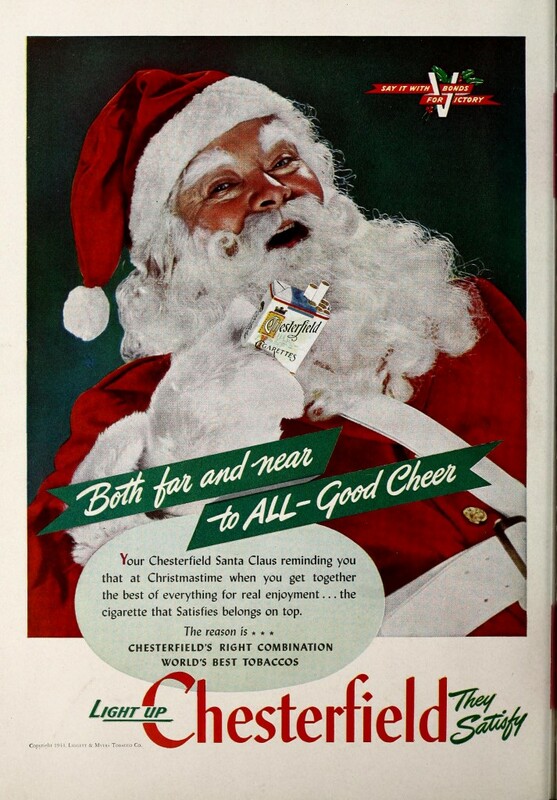 1944: “Your Chesterfield Santa Claus” offers you a a cigarette jovially, while a holly-draped V reminds you to “Say it with Bonds for Victory”. 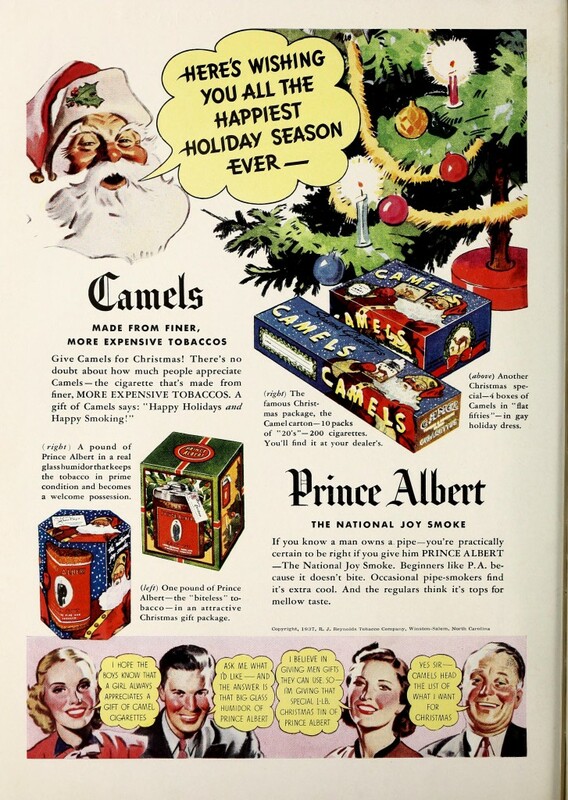 Then, just as suddenly as they started in 1935, there are no more holiday-themed tobacco ads in the Carolina Magazine. 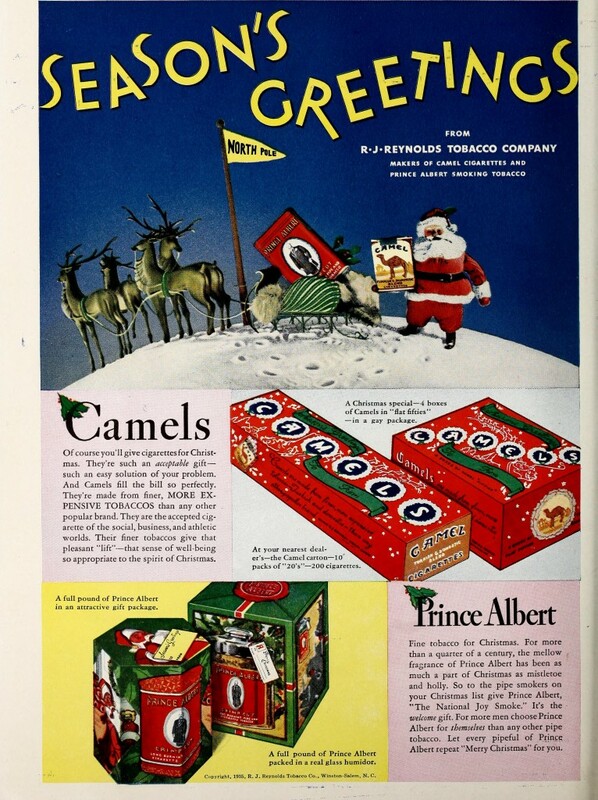 The magazine itself continues until 1948, and various tobacco advertisements still appear, but none are as festive as these. 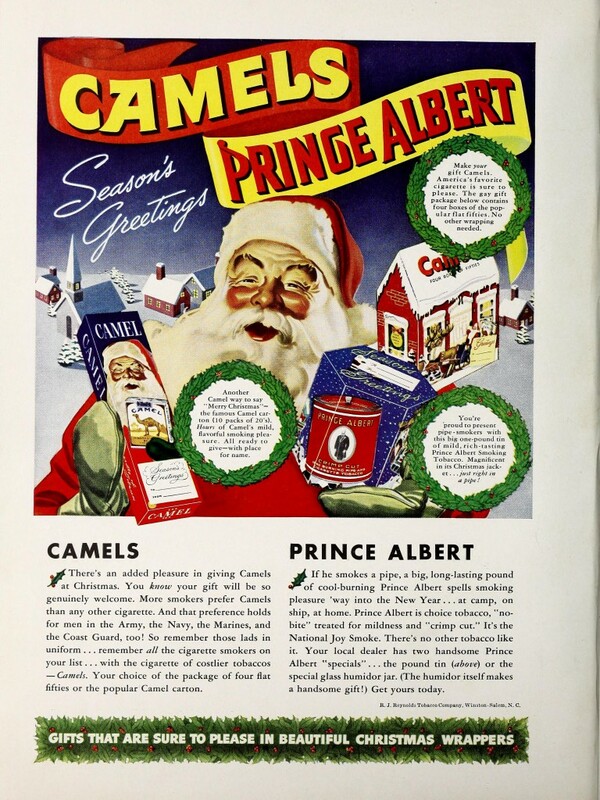 To see more cigarette ads from the Carolina Magazine, check out tumblr; or view the full Carolina Magazines from 1892-1948 on DigitalNC. 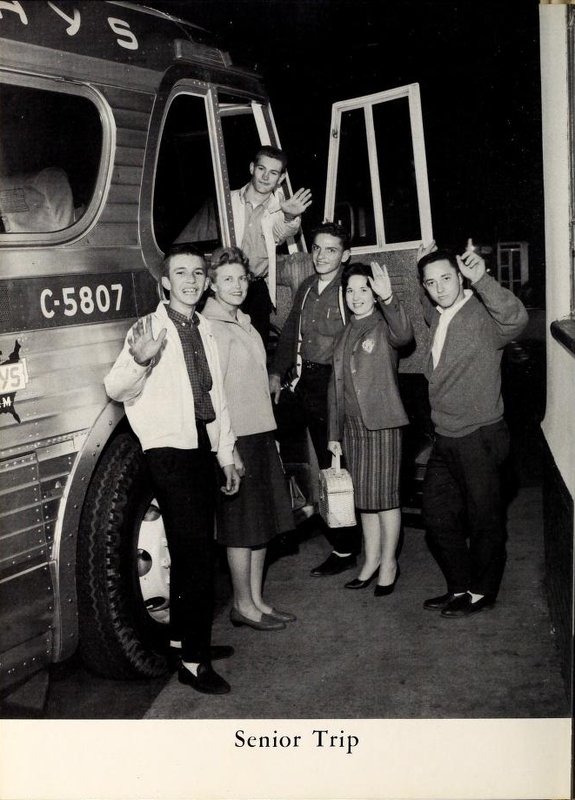 Senior Trip, from Glendale High School’s 1962 The Glen-Cedo Yearbook. 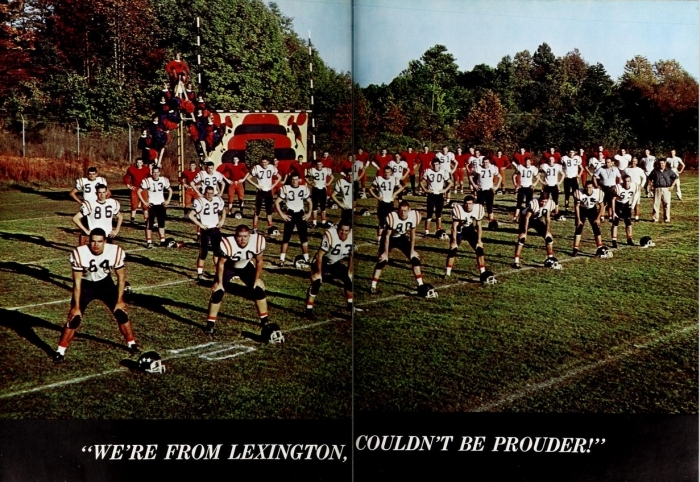 There are now 240 yearbooks and campus publications from Johnston County available on DigitalNC, and over 170 of those were contributed by the Johnston County Heritage Center. 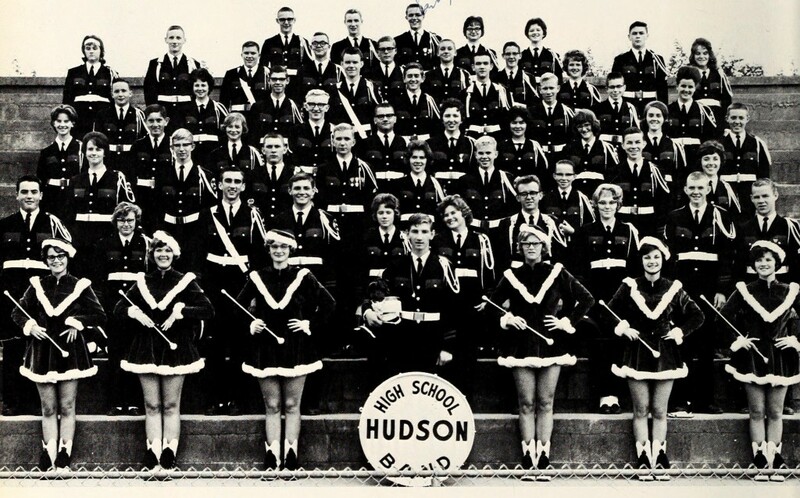 The 1964 Hudson High School Band. View all of the materials from the Caldwell Heritage Museum on DigitalNC. Here on our blog, we occasionally feature “matchups” that showcase relationships between different items in our collection. Today’s matchup? 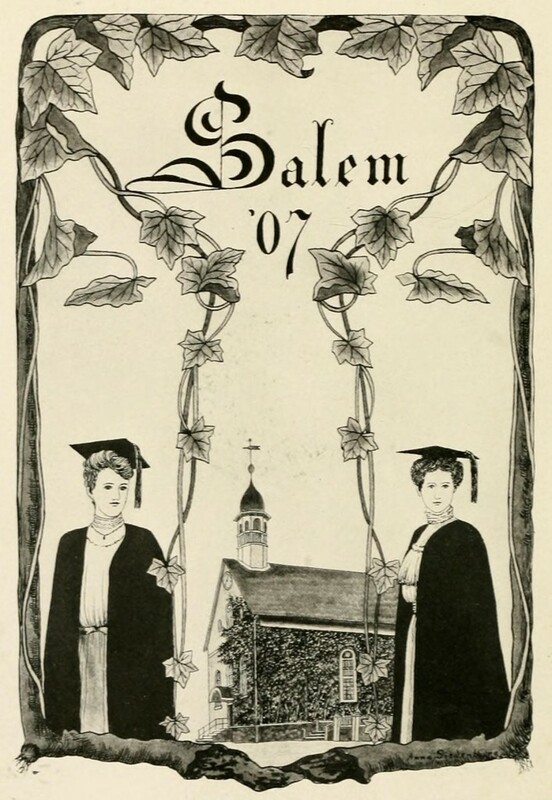 Illustrations in yearbooks from Salem Academy (Winston-Salem) and Elizabeth College (Charlotte). An idle interest in the illustration below led to today’s rather extensive blog post. It wasn’t the artwork that caught my eye, albeit the image is lovely, but the inscription of “copyrighted” at the bottom. This isn’t something I’ve ever noticed accompanying such an early hand-drawn yearbook illustration (and I’ve looked at a lot of them). So I began investigating this copyright-aware student artist… and discovered it wasn’t a student, but a faculty member. 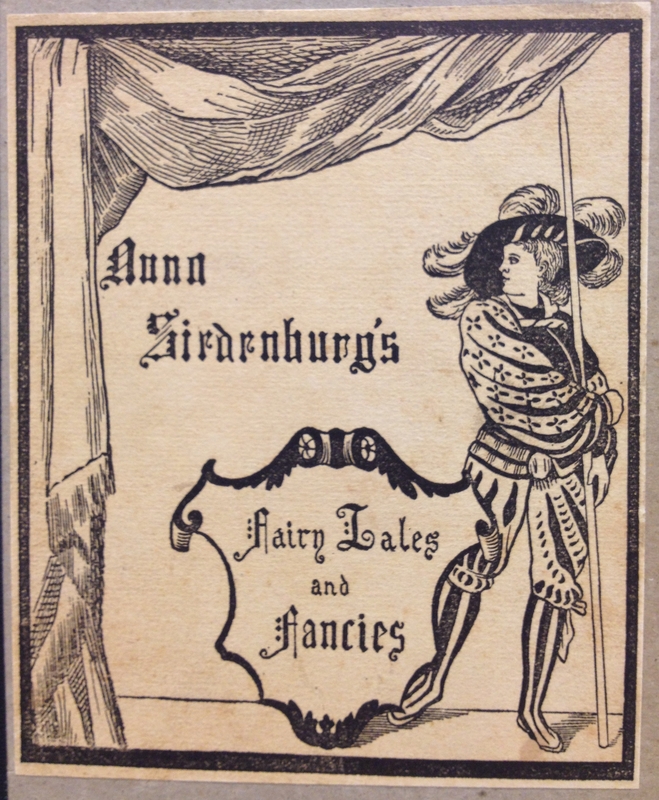 Using just the collection at DigitalNC, I was able to unfold a good bit more about this woman: Anna Magdelene Siedenburg. Signed illustrations by Siedenburg can be found in the 1901 yearbook for Elizabeth College, from which the image above is taken, as well as yearbooks from Salem Academy and College in 1906 and 1907 (see right). There are a good number of unsigned illustrations that could be her work as well (as here), or perhaps they are by students emulating her style. From these yearbooks, I was able to piece together that Siedenburg taught at the two institutions mentioned above from at least 1900 to 1912. She was president and faculty sponsor of art clubs at both schools, and is listed as an instructor in drawing and painting (especially on ceramic and glass), as well as French and German. But where did she come from? The Salem catalog for 1906 states her accomplishments: exhibiting in large American cities like New York, and winning various medals of excellence as well as designing for “leading art journals.” For more information I had to move beyond items on our site. 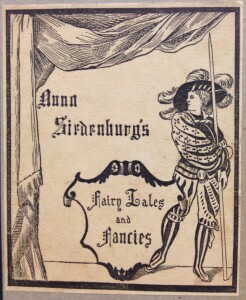 The cover of Fairy Tales and Fancies, by Anna Siedenburg, Chicago, 1895. Courtesy Davis Library, UNC Chapel Hill. It’s hard not to try and imagine the personality of a moderately successful female artist of that time period who traveled widely and seemingly on her own, eventually making her way to North Carolina to devote time to instructing young women. 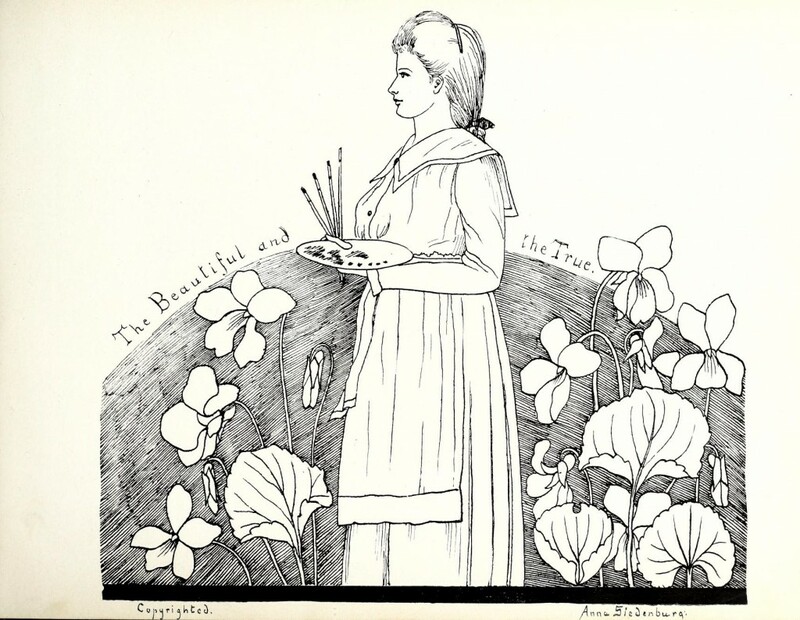 She seems to have been a thoughtful woman who was well liked by her students; the 1906 Salem College yearbook includes a poem entitled “My Seniors,” in which she expresses especial affinity for the graduating class. She was creative. Her book of original Fairy Tales includes a good number of princesses but also strays beyond the stereotypical, as in “Just a Match” which is an allegorical tale about, well, a match. The other pieces of personal information I could find are few, but include a reference to a friend visiting her at a cottage called “Galax,” in Blowing Rock***. I also know she died, single, in Winston-Salem on November 12, 1926*. She was buried in God’s Acre, the Moravian cemetery that’s now part of Old Salem. My hope was to find a picture of her in one of the yearbooks on our site, but most of the faculty photos were unreliably labeled. Thankfully, I have something even better. 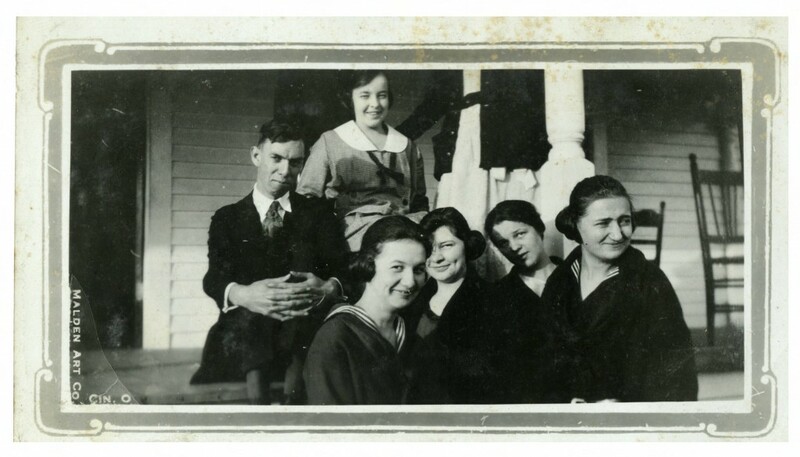 It’s with pleasure that I can present this photo, cheerfully provided by the archives at Salem College, of Anna Siedenburg. 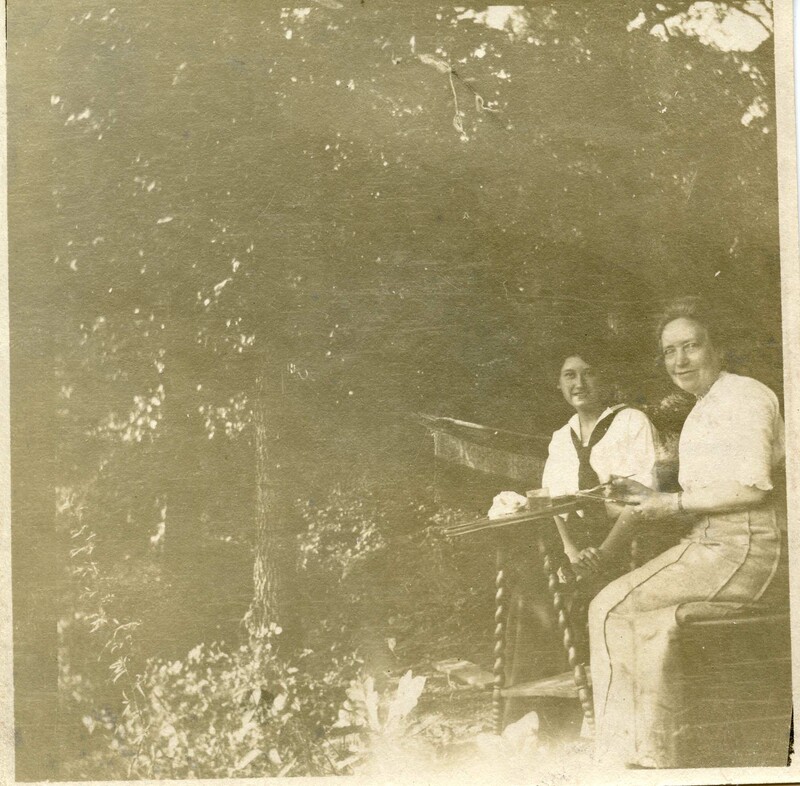 Undated photograph of Pauline Bahnson (left) and Anna M. Siedenburg, Bahnson graduated Salem College in 1910. Courtesy Salem College Archives. *Source: Ancestry.com. North Carolina, Death Certificates, 1909-1975 [database on-line]. Provo, UT, USA: Ancestry.com Operations Inc, 2007. Original data: North Carolina State Board of Health, Bureau of Vital Statistics.North Carolina Death Certificates. Microfilm S.123. Rolls 19-242, 280, 313-682, 1040-1297. North Carolina State Archives, Raleigh, North Carolina. ** The Art Amateur (February 1898) p. 76. ***The Orange County Observer newspaper (June 25, 1908) p. 3. 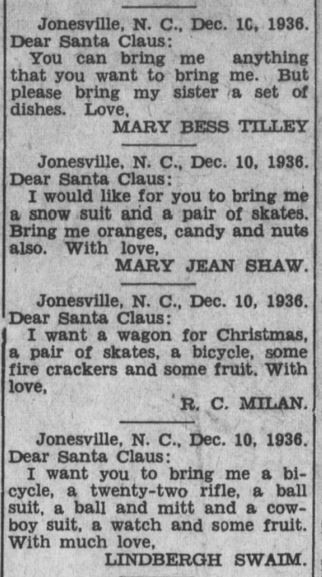 What did children in early 20th century rural North Carolina want for Christmas? Oranges. 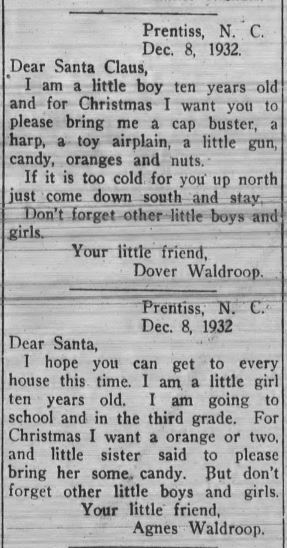 Based on our highly unscientific survey of letters to Santa published in local newspapers from the 1920s through the 1940s, oranges appeared more often than anything else, usually paired with nuts and candy. In an age before widespread refrigeration and quick cross-country transport, oranges were still fairly exotic, and, apparently, in high demand among children. As far as requests for toys, they were split pretty predictably by gender. 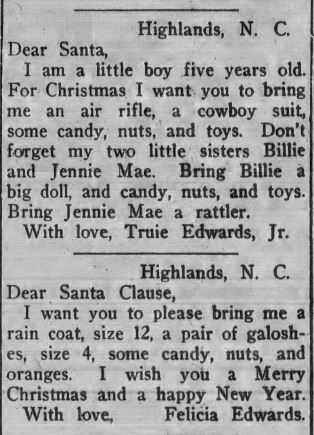 Lots of girls asked for dolls, especially dolls that had eyes that could open and close and could say “Mama,” while boys asked for toy guns and bikes or wagons. 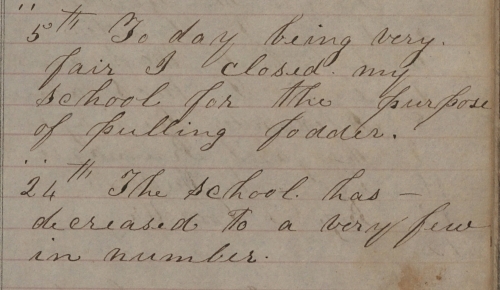 These letters were a regular feature throughout the month of December in many of the small-town weekly papers that we’ve digitized. Many are short and to the point, lots are amusing, and a few reveal heartbreaking details about the difficult lives led by some of the kids. We’ve posted a handful of examples below and will share others throughout the month on our Twitter feed (@ncdhc). 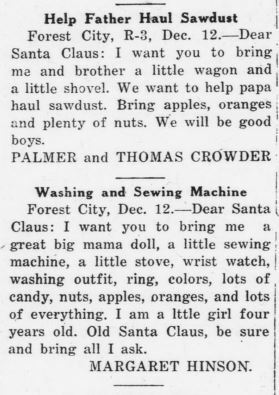 Letters to Santa from The Franklin Press, December 21, 1933.
Letters from The Franklin Press, December 2, 1932.
Letters to Santa from the Forest City Courier, December 15, 1927. The archives of The Grand Lodge of Ancient, Free and Accepted Masons of North Carolina is one of our newest partners, with photographs, a scrapbook, Lodge publications and more added to DigitalNC. Chartered in 1771, the Grand Lodge is one of the oldest institutions in the state. Many prominent early North Carolinians–William Hooper and Richard Caswell for example–were members. The archives is currently located in the Executive Office Building on Glenwood Road, in Raleigh; many photos shared through DigitalNC in the current batch show the building, including sketches of the murals in the main lobby created by Allyn Cox, who also provided murals for the U.S. Capitol. Sketch of one of two murals in the Grand Lodge Executive Office Building in Raleigh. Artist: Allyn Cox. Photo of mural in Grand Lodge Executive Office Building, Raleigh, N.C. Courtesy the NC Museum of History. We hope to share more from the Grand Lodge in the future. View all of their items currently on DigitalNC.